A sweet 'n gooey spin on a breakfast fave... Hooray for that! In a wide bowl, combine egg whites/substitute, protein powder, cinnamon, and vanilla extract. Add half of the sweetener packet, and whisk thoroughly. Evenly soak bread on both sides in egg mixture, until all the mixture has been absorbed. Cook until golden brown, 1 - 2 minutes per side. 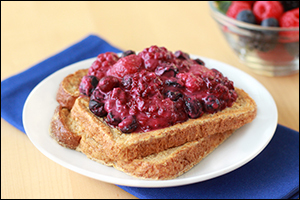 In a medium microwave-safe bowl, toss berries with the remaining half of the sweetener packet. Add peanut butter, and microwave for 15 seconds, or until peanut butter is warm. Stir to coat, and spoon over French toast! Bring a skillet sprayed with nonstick spray to medium heat. Cook and stir pepper until slightly softened, about 2 minutes. 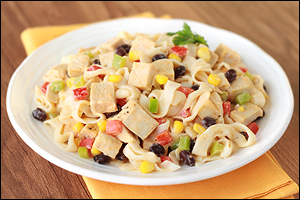 Add noodles, sour cream, taco seasoning, and cheese wedge, breaking the cheese wedge into pieces. Cook and stir until cheese has melted, mixed with sour cream, and coated noodles, 2 - 3 minutes. Add remaining ingredients, and cook and stir until hot, about 2 more minutes. Enjoy! Wanna learn more about The Hungry Girl Diet? Click here! Looking for support and the ability to easily log your food? Join the HG Diet Community! Like a little assistance planning your food and assembling your shopping list? Our free Hungry Girl Diet app (available for iPhone and Android) is just what you need! And for online savings of up to 40 percent(! ), check out our sale page, and click around for the best deal! Whether your pals are looking for a weight-loss solution or simply love fantastic food, click "Send to a Friend" now!